Raised in Berkeley, then Marin, in the San Francisco Bay Area, Laura grew up loving fabrics, art, texures, color, and nature. Today she has six published books for sale, teaches numerous quilting classes at shops, quilt guilds, private studios, and at international quilt festivals. 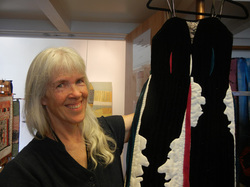 She has hundreds of quilts and wearables for exhibition and sale, many of which have exhibited in museums and shows across the continent. She spends her days doing longarm quilting for clients, tending her fiber-producing sheep and the organic gardens they fertilize, and digitizing her continuous-line designs so you can stitch them out if you have a computerized quilting system. Home is in Black Point, outside Novato California, with her husband Ron Paul, the longarm maintenance man, and a bluetick coonhound.